Amazon has long relied on customers providing feedback and other ranking data as part of the process of encouraging more sales on its platform, and now the e-commerce giant is adding a new twist on this to spur more buying in its books business. Today, Amazon announced Amazon Charts, a new kind of bestseller list that will give users, for the first time ever, a top 20 list of ‘most read’ books on Amazon — a new metric that combines how much books are read on Kindle and listened to via Audible. Alongside this, Amazon is also going to provide a new kind of ‘most sold’ top 20 list, which will now include not just books sold and pre-ordered, but those that are also borrowed each week on Amazon.com, Audible and Amazon Books. It will also provide other selective stats and data about their sales in the process. This is not the first time that Amazon has provided book rankings. Since the launch of Amazon, the company has provided a best sellers list for books, measuring how much titles have sold, both in general rankings and in specific categories. It has also provided a degree of sales analytics to authors as part of its push to bring more people to publish and sell on its platform. And the company has long been trying to think of more effective ways to push the social angle, using information about what others are reading as way to encourage more sales. Possibly the most notable movement Amazon has made on that front was acquiring the popular Goodreads service in 2013, reportedly for about $150 million, to bring on a social network of sorts where people can track what their friends and others in the Goodreads community are reading and how they rate those books. If Goodreads is a more long-tail picture of how our friends and other like-minded people are reacting to the wider corpus of books in the world, you can think of Amazon Charts is the new, zippier approach to the same idea. David Naggar, the Amazon’s VP of Kindle Content, says that it’s an attempt to provide a pure-data recommendation list that cuts through some of the human curation that colors other bestseller lists. What’s notable here is how Amazon is sticking very closely to data on its own huge platform to encourage the closed loop. Within that, Amazon is also providing mini dashboards providing other measurements of how a book is being consumed. 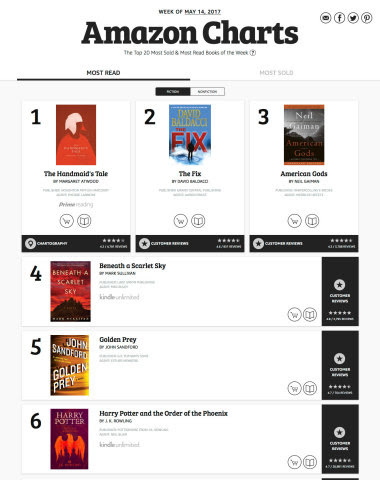 When I looked earlier, Margaret Atwood’s The Handmaid’s Tale was listed as the most-read book in the US. Amazon also provided me with a “chartography” for the novel, which informed me that it is the most popular book in the state of Maine. (Why Maine? I don’t know exactly, but it may have to do with where the book is set.) It also provided some information about how the book has now been made into a TV series. These data points are selective, and it’s not clear where Amazon will choose to reveal what it does. The main reason I mention it here is because it opens the curtain a bit on just how much data the company is amassing all the time on what is being sold and consumed via its vast sales and distribution business. This is, in the end, all in the name of bringing in more customers: each title’s box links through to the books’ sales pages. And for those who are so inclined, Amazon is also linking up Charts with Alexa as one more thing you can now ask your Echo or other device powered by its voice assistant. “Alexa, what are the most popular books this week?” will give you a verbal run-down of the top-20 lists. As Alexa and Amazon’s efforts in voice-interfaces continue to grow, you should expect to see integrations like this become a central part of more (and maybe all) of the company’s future product launches.